Guppies have been evolving for at least half a million years and yet there is one characteristic of them that seems to have remained exactly the same where the male guppies are concerned. Male guppies have continued to have an orange patch and it is believed that this is because it is the colour that the female guppies like. Greg Grether is a co-author of a study that has just been published that carried out this research, "Sometimes populations have to evolve just to stay the same. In this case, the males have evolved back over and over again to the colour that females prefer." It is carotenoids and drosopterins that are responsible for the orange patches on male guppies. 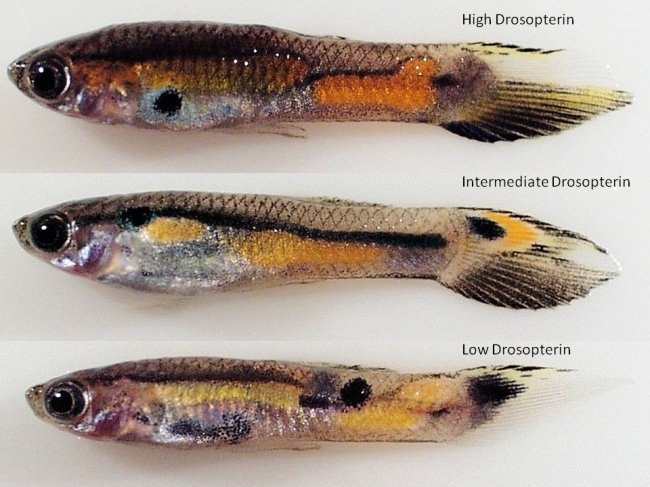 The lead author of the study, Kerry Deere, presented female guppies to a choice of males. The males had low, medium and high levels of drosopterin respectively. In the experiments the females were effectively being offered a much wider range of pigment choices than they would normally experience in the wild and then being observed to see which they preferred. Over 100 of these trials were conducted and it was shown that the females did seem to continually go for just the right shade of orange. "The females preferred the males with an intermediate drosopterin level by a highly significant margin," Deere said. On the same topic, Grether said, "Males that are closer to this preferred hue probably have more offspring,"
However, the trials did not instantly answer all questions, "A pattern I discovered 10 years ago, which was mysterious at first, is that in locations where more carotenoids are available in their diet, guppies produce more of the drosopterins," Grether said. "There is a very strong pattern of the ratio of these two kinds of pigments staying about the same. To human eyes at least, as the proportion of carotenoids in the spots goes up, the spots look yellower, and as the proportion of drosopterins goes up, the spots look redder. By maintaining a very similar ratio of the two pigments across sites, the fish maintain a similar hue of orange from site to site. What is maintaining the similar pigment ratio across sites and across populations? The reason for the lack of variation is that genetic changes counteract environmental changes. The males have evolved differences in drosopterin production that keep the hue relatively constant across environments. As a result of Kerry's experiment, we now have good evidence that female mate choice is responsible for this pattern." Deere explained. There are a number of different cases in which genetic variation in a trait masks environmental variation but it is normally extremely hard to find the cause and there are very few cases of this that have been fully explained. "I originally assumed if there was variation among populations in drosopterin production, it would be the populations where carotenoid availability was lowest that were producing more of these synthetic pigments to compensate for the lack of carotenoids in their diet. But we found the opposite pattern," Grether said. "They're not using drosopterins as a carotenoid substitute; they're matching carotenoid levels with drosopterins. Why they are doing that was a mystery. The answer appears to be that it enables them to maintain the hue that female guppies prefer."